As an old school PC gamer, when someone mentions the word Descent I get a little dizzy. The original claustrophobic six degrees of freedom shooter, Descent put you in control of a ship deep underground rescuing miners and shooting baddies. When Miner Wars 2081 was announced it was easy to make the comparison and hope to recapture some of that magic that was felt while playing Descent. 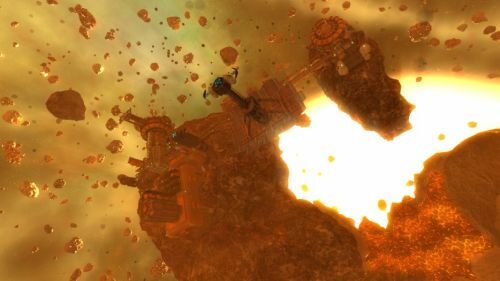 Miner Wars 2081 is an ambitious part of a larger puzzle in the Miner Wars universe that includes an eventual MMO. The groundwork is laid here with a full campaign spanning 30 plus missions and support for up to 16 players in co-op. The game puts you into the shoes of Apollo and his brother Marcus as they try to uncover why their peaceful mining operation was suddenly attacked by Russian enemies. The universe of Miner Wars exists after a bizarre gravity incident destroys all planets in the universe leaving only rocky asteroid filled systems that once harvested life throughout the galaxy. Throughout the game you’ll travel between these systems and the bases located on them, fighting enemies not only in space, but inside the asteroids themselves. At times Miner Wars 2081 can look really pretty, while other times the environments feel bland and barren. It’s hard to put my finger on exactly what it is, but there seems to be two dichotomic graphical styles - one almost realistic while another is almost cartoony - and these depend on which area you are actually in. Controlling your ship with the WASD keys and mouse works well enough and there’s even the ability to strafe in multiple directions. Your ship itself is fully customizable as you can salvage or purchase equipment to customize weapons, armor, fuel, and other extra goodies. Obviously with a name like Miner Wars you’d think mining plays a big part in the gameplay, or at least some part. Sadly it just seems like a small distraction, it’s never a requirement other than the select few times you have to dig through part of an asteroid. Your HUD will be filled with various mineral deposit locations, which you can mine and then sell for a profit - but I never was short on items or salvage from the normal missions to need to waste time doing this. Perhaps that was for the better. One thing to be said about Miner Wars 2081 is its a brutally difficult game. On normal you’ll find yourself dying many times over as you are faced with dozens upon dozens of enemies. Part of this issue with this is the game’s combat system which leaves me with an unsatisfied feeling. It’s best expressed when you watch someone get hit by a few stray bullets and watch the model spin uncontrollably for a few seconds. It just looks silly and floaty - and shooting the enemies in Miner Wars 2081 feels the same. There’s just no punch to it, it’s like shooting cardboard with a BB gun. It’s sad too because there’s a deceptively deep ship system at play - with full armor, oxygen, hull integrity and other systems you need to worry about. You can become damaged to a point where your ship leaks oxygen and you’ll need to find or use a repair kit and then refill your ship’s oxygen as well or else you’ll die. These random items are left around the game world and instead of picking them up, you simply go up to them and press the space bar. Again, it’s just unsatisfying.